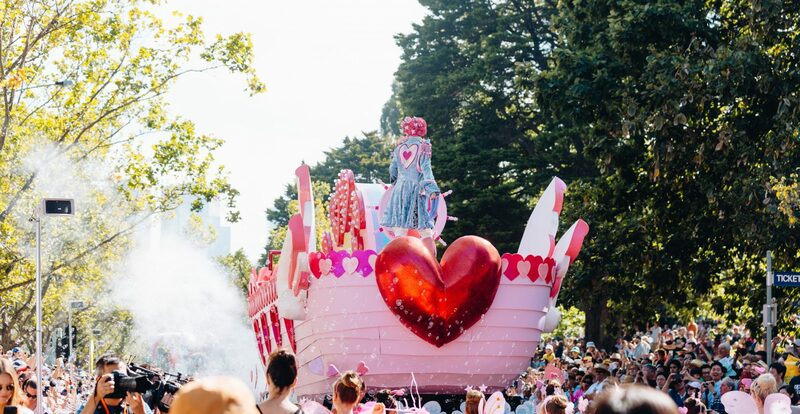 Since 1955, the Moomba Parade has captured the hearts and imaginations of Melburnians, bringing to life the vitality and energy of the beloved festival. As well as the larger-than-life floats, which were designed by children who took part in last year’s Design a Float workshop (read about them below!). The parade features dance troupes and community groups, and will be officially opened with a Welcome to Country address by the Wurundjeri Tribe. The Moomba Parade will run from 10.45am – 12pm on Monday 11 March. It’ll start at Birdwood Avenue then weave through the picturesque Kings Domain parkland and conclude on Linlithgow Avenue near Queen Victoria Gardens. This mini-Einstein was thinking big explosions and bubbling test tubes when coming up with her float design. The result? A mind-blowing creation to match her love for all things science. To top it all off, she’s even added a steaming volcano! When she’s not at school learning about her favourite subject, Alannah loves netball, gymnastics and swimming. This is her fourth trip to Moomba and she’s bursting to go on all the rides again this year. If you ever go to Leeloo’s house you might find fairies living in the tree at her front gate. This was the inspiration behind her float design. She took the idea of a fairy house and added some details like mushrooms to create a magical addition to the parade. This young designer’s favourite subjects at school are music and art and she's super excited to be in the parade and is counting down the days until she sees her fairy house float in action. This tiny designer loves squiggles so much that her float features a giant squiggly animal with a huge smiley face, a tail and a tonne of colour. When she’s not being creative with her pencils and paper, Nicole loves a good boogie and last year she even danced along with Moomba’s break dance groups. At this year's festival she’s gearing up for the fireworks, and of course seeing her float creation come to life. Raff is a smart cookie with a huge talent for designing extraordinary floats so when we spotted his robot design we knew it’d be perfect for this year’s parade. At school this 9 year old artist enjoys studying prehistoric life and world conflicts. He’s hoping that at this year’s Moomba Festival he’ll be on the news (watch this space!) so keep an eye out for him on the telly. This might be the first time we’ve had a gold-medal-winning, record-setting athlete amongst our float designers. When she’s not taking home titles in shot put and discus, you’ll find Ella practising French or learning about history - those are her favourite subjects at school. She was inspired by all things nature when designing her float so naturally it features bugs, birds and loads of colour. When Rory got the call that her design had been chosen for the parade she wanted to scream with excitement but she was on a tram so thought she’d better play it cool. This 9 year old adores llamas and cacti so she put these things together to create ‘Llama Float a Rama.’ She’s visited the festival three times and loves the water-skiing, the rides and of course, the parade. Let your imagination run wild and design a float, it could end up being in the Moomba parade 2020! Melbourne Dai Loong Association Inc.
Victorian Thai Community Association Inc.